Trai Airtel, Dish TV, Hathway Channel New Price List and Plans 2019: TRAI's new framework for DTH, cable operator: What happens if one does not choose channels before January 31 and will there be a blackout? All your questions answered. TRAI’s new framework for DTH, cable operator: What happens if one does not choose channels before January 31 and will there be a blackout? All your questions answered. What is TRAI’s new framework for DTH and cable operators? TRAI’s new set of rules are aimed at offering “freedom of choice” to consumers and give them “direct control” on their monthly bill for television services. 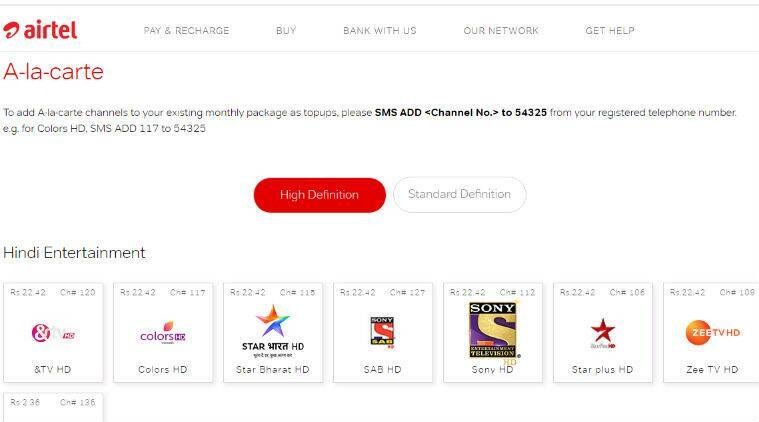 So, subscribers of cable, multi-system operators (MSOs) as well as DTH services such as Airtel Digital TV, Dish TV, etc will need to select individual channels they wish to watch and only pay for those. Airtel Digital TV has separate combo packs for major Hindi entertainment channels including TV shows and movies. 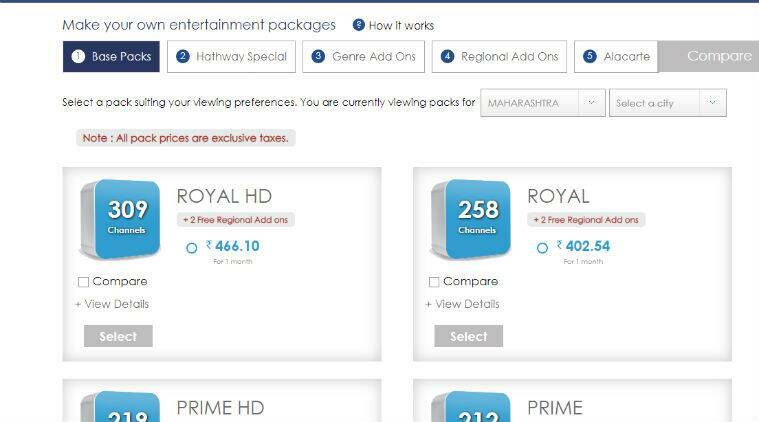 DTH and cable operators have already started to release individual channel prices lists as well as combos to make it easier for subscribers to choose channels packs. What is the deadline and will there be a blackout? Consumers have till January 31, 2019 to select channels which they want to subscribe to. Though TRAI insists that there will be no blackout and the transition from old to new framework will be smooth, subscribers are advised to select their channels to avoid inconvenience. The regulatory body has not revealed exact details of what will happen for users who do not choose select channels before January 31. Hathway also gives its subscribers to either choose from a-la-carte or Hathway Special packs. How much will the base channel pack cost? All users need to subscribe to base channel pack, which will cost Rs 130 plus taxes. It comes to around Rs 154. It will give users access to a total of 100 channels that users can choose from a list of 500 channels. The base channel pack will also include 26 channels from Doordarshan. What are the prices of channels and how to subscribe? 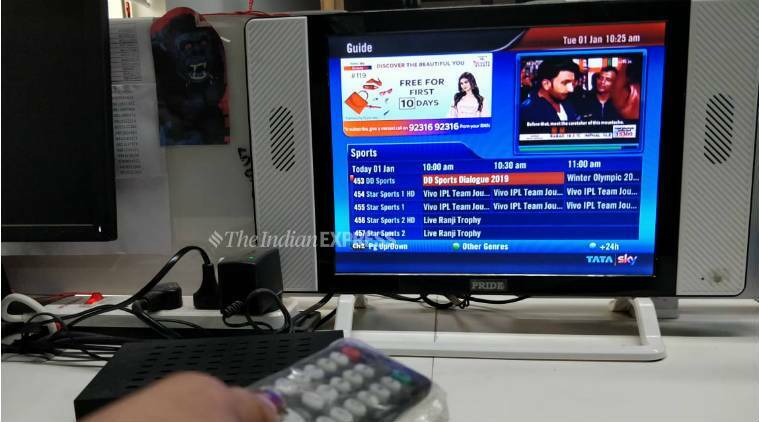 Airtel Digital TV, as well as Dish TV along with cable operators like Siti cable, Hathway and Den Networks, have already released their channel prices lists. Users can also consider combo packs that offer multiple channels bundled into one pack. In this case, users will be charged as per the pack price and not individual channels. For instance, Airtel Digital TV has separate combo packs for major Hindi entertainment channels including TV shows and movies. Then there are combos that include Hindi entertainment, movies, sports, English movies, and entertainment channels as well. Dish TV has a similar list, both for individual channel prices as well as packs. Star India packs include Telugu Value pack, Hindi HD Premium, and more, while Times Bouquet 1 HD, Times Bouquet 2 HD are packs from Times Network. More channel packs from Turner International as well as Sony Pictures Networks are listed as well. 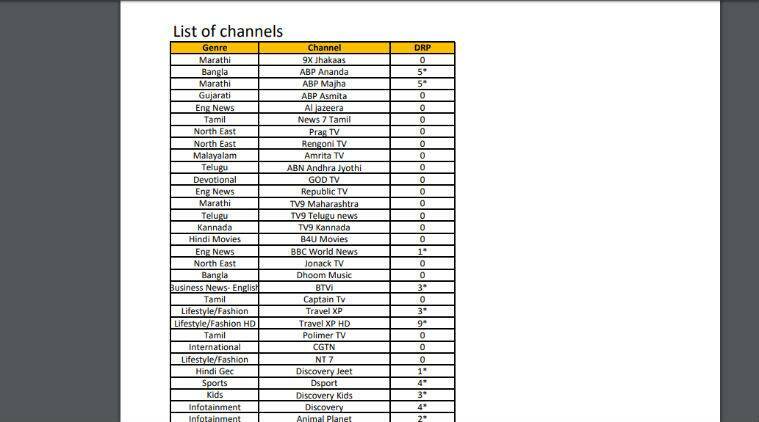 DishTV’s list of pricing for individual channels. Hathway also gives its subscribers to either choose from a-la-carte or Hathway Special packs. Den Networks also has bouquets, while Siti Cable users can choose from a list of five channel packs. Consumers are advised to call their respective service providers to know more details about how to subscribe and more. Airtel Digital TV has listed on its website the process of subscribing, which can be done by sending a message with channel number or package code from registered mobile number.